What are the common causes of fatigue? Natural energy boosters are not difficult to find. Eating a well-balanced diet that incorporates fresh fruits and vegetables is a simple way. Also, adequate sleep is a vital component to support natural energy levels and increase stamina. Getting the recommended 8 hours of sleep per night can also help to stave off fatigue. Scientists are still unsure of the exact processes in the brain that take place during sleep, but what they do agree on is that sleep is an anabolic, or building, process - sleep helps to restore the body’s energy supplies that have been depleted through the day’s activities. Natural remedies and herbs have been shown to promote endurance and healthy energy levels. There are now many published clinical studies demonstrating the natural energy tonics present in a wide range of herbs for energy health. 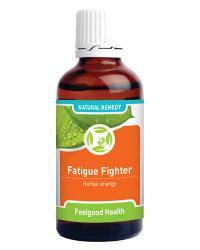 Fatigue Fighter is an all-herbal booster formula to increase energy levels and fight fatigue naturally. Do you always feel tired and depressed? Is it difficult to get out of bed in the morning? Do you feel sleepy and listless? Or are you functioning well, but want that 'extra boost' to optimize your performance and add extra Voom? Now you can give your body the boost it needs with Feelgood Health Fatigue Fighter. Fatigue Fighter is especially formulated to increase energy levels, improve mental and physical performance and beat fatigue. Unlike many other formulae, Fatigue Fighter contains no stimulants or artificial substances and is safe, non-addictive and effective. Fatigue Fighter not only fights fatigue and boosts energy levels, it also improves overall systemic functioning and helps to balance all body systems naturally and without stress. Fatigue Fighter is perfect for athletes and sportspeople, as well as for those suffering from fatigue and chronic illness . Combining the powerful effects of Asian and Mediterranean herbal medicine, Fatigue Fighter's Natural Power Booster formula can help you to feel stronger, more energetic and full of life. "I am a very keen sportsman and take my sport very seriously. I have tried many products which claim to boost energy levels and have never been very impressed until I tried Fatigue Fighter. After only two weeks I began to notice that I could exercise longer and harder than ever before without becoming tired. It was as if the medicine supplied an extra store of energy inside me that just kept me going and going. I also find my mood has improved and I walk around with a bounce in my step and a smile on my face. Thank you for an excellent product!" "I can recommend this product for people recovering from ME (Chronic Fatigue Syndrome) like myself. There is a definite difference and the feelings of exhaustion and depression have almost completely gone. I will keep taking Fatigue Fighter for sure!" "As a mother and a housewife I am always on the go and never have time to put my feet up. I know I don't eat properly and never have a chance to exercise (although I run after three children all day so that must count! :) Sometimes I feel like I could just collapse and in the morning I can't get out of bed without forcing myself. This has all changed after I started taking Fatigue Fighter. A friend told me to take it and I am not sorry. I think I am a much nicer, happier and more energetic person and I even found myself singing in the shower the other day which hasn't happened for ages!" Fatigue Fighter contains the following medicinal herbs, specially selected for their energy boosting and fatigue fighting properties. Eleutherococcus senticosis (Siberian Ginseng) A botanical cousin of Panax ginseng, this herb has been used in ancient Chinese medicine for thousands of years to enhance the vital energy of the body and to sharpen physical and mental performance and endurance. Recent research has clinically proven that regular use will help to increase physical and mental performance, withstand stress and boost immune functioning. Siberian Ginseng has been approved by medical authorities in Germany as an invigorating tonic for fatigue and to protect against and recover from illness. Centella asiatica is a well respected herb in Ayurvedic (Indian) medicine. A favorite food of elephants, Centella asiatica contains chemicals called triterpines (including asiaticoside), which have the effect of enhancing collagen formation in bones, cartilage and connective tissue and promoting healthy blood vessels. Research has also demonstrated the beneficial effect of Centella asiatica on memory, concentration and mental performance levels, making it a herb of choice for students and scholars of all types. Olea europea (extract of Olive leaf) is used to fight a variety of illnesses and to protect the body against disease, ailments and infection of all types. It is said to be particularly effect against hard to treat illnesses such as Chronic Fatigue Syndrome, Epstein-Barr Disease and herpes. Olea europea is also effective in lowering high blood pressure and reducing cholesterol levels. As a powerful anti-fungal, it also fights yeast infections and can reduce candida overgrowth in the system, one of the major causes of fatigue. For maximum effect, use as part of a healthy lifestyle, diet and exercise program. Fatigue Fighter may be used as a powerful adjunct to our unique EcoSlim formula and the 5 day Detox and Weight Loss Program. Many people see definite results after only a week as they begin to feel more energetic and less tired. People who have chronic illnesses or very unhealthy lifestyles may take slightly longer to respond, but improvement should be noted after 3 - 5 weeks. One bottle of Fatigue Fighter will last approximately a month. See our BUY 3 GET 1 FREE special offer. Caution: Safety during pregnancy or breastfeeding has not been established. Consult your doctor before using Fatigue Fighter if you are taking prescription medicine for heart complaints. Do you want to lose 2 - 5 kilograms in five days while still following a healthy diet? Do you need to detox and cleanse your system to kickstart your weight loss efforts? Are you tired of long, complicated and difficult to follow programs based on dubious weight loss theories? Do you need support and encouragement every day to help you to resist temptation? Do you need an easy to follow detox and weight loss program combined with a guided exercise regime to maximize your weight loss, while boosting your metabolism and energy levels? The Feelgood Health 5-Day E-mail Detox and Weight Loss Program is especially designed for those who want to lose weight quickly and safely, but struggle to stick to a diet for any length of time. You will receive a free e-mail copy with your order of Fatigue Fighter. Five Days Is All It Takes! Using simple recipes and everyday ingredients, the Feelgood Health 5-Day Detox and Weight Loss Program is short enough to stick to and effective enough to shift those kilograms. In just five days you could be 2 - 5 kilograms lighter and well on your way to your target weight. One bottle Fatigue Fighter Power Formula to boost energy levels, banish fatigue and improve systemic health. Follow the Feelgood Health 5-day Detox and Weight Loss Program Monday - Friday and take a weekend break. Keep repeating until you reach your target weight. What could be easier? More Energy Pack! Fight tiredness plus remedy to help your thyroid! Feeling rundown? Pep up and fight fatigue plus all round immune support! Protect your body against overindulgence plus remedy for extra pep! Recharge Me Combo: Fight fatigue while detoxing toxins for a fresh outlook!